Street food always tastes better on the street right? Possibly not in this case. 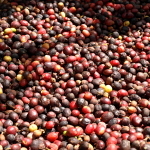 The humble chickpea is one of the oldest cultivated foods in the world having been around for over 7000 years. It’s an incredibly versatile ingredient that is high in protein, cheap and can be used in all sorts of ways and you don’t have to be a true blue vegetarian to appreciate meals where chickpeas are the main attraction. We’re massive fans of the chickpea and use it in stews (with and without meat), to make hummus and, one of our favourites that we keep coming back to again and again, falafel. 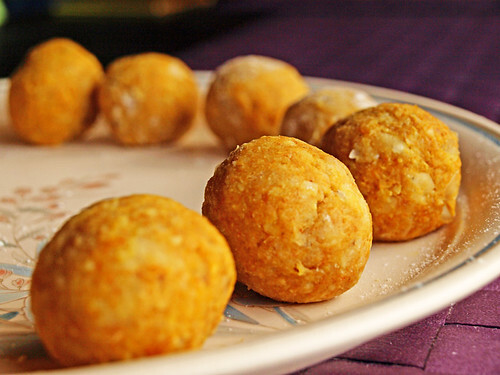 These fried, spicy balls are commonly dished up as street food in the Middle East where they’re often served with lettuce and salad and wrapped in pitta, or flatbreads. 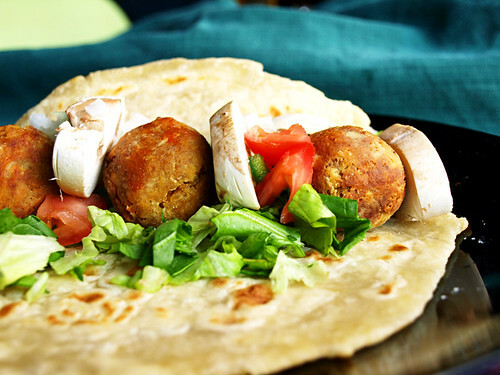 Our recipe for falafel is a variation on these hand-held savoury packages. Maybe I’m biased but this recipe makes seriously good falafel that boasts an exotically spicy personality. It brings eating street food right into the home… or wherever you happen to be. Preparation takes about 30 minutes with actual cooking time around 10 minutes. This recipe is for 4 People (or 2 servings for 2 people if you only use half the falafel and freeze the rest till you get a yen for your next falafel hit). Drain and rinse the chickpeas. Transfer to a bowl and mash with a potato masher till smooth. Add crushed garlic, a quarter of the chopped onion, cumin, cayenne pepper, paprika, coriander, ras el hanout, salt, pepper and mix thoroughly. Add the beaten egg a little at a time and stir until the falafel mixture is moist, but not sloppily wet. Dust hands with flour and, using a dessert spoon, scoop out some of the falafel mixture and roll into a ball (a 400g jar should make 24 decent sized balls). I wash my hands every 4-5 balls otherwise I end up with more of the mixture on my hand than on the ball. 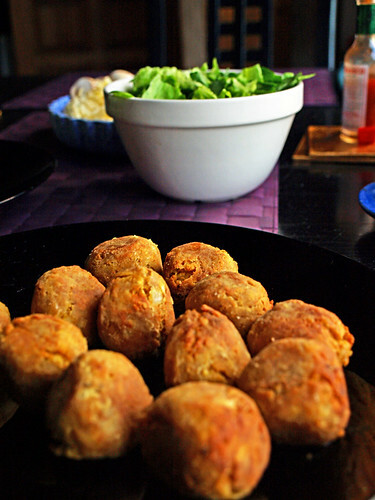 Place each on a plate and, when all are looking nice and uniform, chill the falafel balls for at least 10 minutes. Whilst the falafel is being chilled, put the shredded lettuce into a bowl and arrange the rest of the chopped onion, diced tomatoes, green peppers, mushrooms, grated cheese and lemon wedge on a plate. After the falafel has been chilled roll them in flour (this helps prevent too much spitting of hot oil when they are being fried) and gently fry them in the olive oil for 10 minutes, turning regularly until the falafel balls are golden. Remove, pat dry on kitchen roll and serve with the tortillas/pitta and salad. Nearly the finished article. Just need to roll it up. Oops, think I might have overfilled it. This is the fun part. Serve 6 falafel balls per person (3 per tortilla). 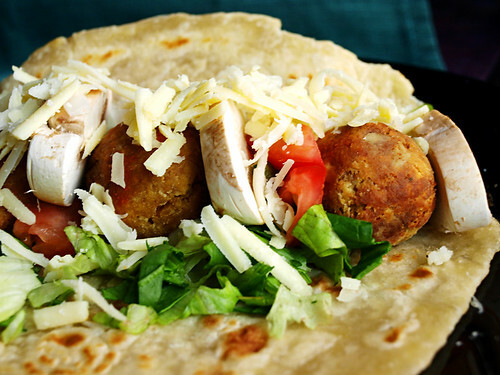 Place some of the shredded lettuce on a tortilla and put 3 falafel balls on the lettuce. Arrange diced tomato, peppers, sliced mushrooms and chopped onion in between each ball. Squeeze some lemon juice over the falafel and then a couple of splashes of Tabasco. Top with the grated cheese, roll up the tortilla (folding in the bottom to avoid spillage) and get stuck in. Then repeat… which is sometimes what can happen as a result of eating chickpeas.